Whether you are a former smoker or have acquired some used furniture from smokers, the odor is not pleasant and can be difficult to remove. This is a guide about removing smoke odors from furniture. After cleaning the cabinet with vinegar and keeping a pan of charcoal in the cabinet for a couple of days, it still smelled like smoke. I sprayed it inside and out with orange scented furniture polish, then wiped it down. Now it smells like oranges! My husbands Aunt gave us a chair with a stool. The problem is that she smokes and the chair smells terrible. I tried to Febreeze it. I Febreezed it to death but can't seem to get rid of the smell. The chair was well taken care of otherwise. I don't know what to do. Please help. You can try sprinkling a tiny bit of vinegar on it. It may take 5-7 applications, but it should work. In between a couple of dry-times, sprinkle with baking soda, let set for a couple hours. Then vaccum clean. Vinegar again, etc. You could try using a steam cleaner with an upholstery attachment. If you don't have one, you may be able to rent one with this attachment. Cigarette smell is a pain to get rid of. Good luck! I had a chair just like that! I also tried to Febreeze it, but like you said, it doesn't really work. The only thing that really worked for me was cleaning it with a steam cleaner, and then sitting it out in the sunshine for a while. It still smelled faintly of smoke, but it was much less. Know that bicarbonate soda is great for sick and urine never tried it on fag reek but if you wet the chair down and sprinkled and hoovered once dry may just work. Might be worth a shot if nothing else works. A product called Zero Odor, works WONDERS!! My mom lives with us she smoke, Zero odor works on smoke smell. Cat boxes, doggie bed, musty basement smell! It's a little pricy, but you don't use much and it REALLY does work. My mom uses Simple Green to clean after my brother's been staying at home for awhile (he's a smoker). Just be careful and test it if its a light color. If its so strong that doesn't take care of it, she steam cleans it and sits it out in the sun. A few times in the fresh air and it using smells fine again. I'm trying to clean some sunroom furniture - with bamboo-type wood, and am having a hard time getting the smell out. the thing that seems to help most is getting a pail with a gallon or 2 of hot water, add several drops of essential oil of cinnamon (health food store), a one-pound container of baking soda, 1 or 2 tablespoons of shaklee's basic I (or maybe a regular dish soap would work), and about 1/4-1/2 cup of calcium hyroxide (Mrs. Wage's Pickling lime- available at grocery store). This stuff is the most powerful degreaser (cig smoke leaves an oily residue), as well as a super-strong alkaline mixture (cig smoke is really acid)... After dousing it with this, I still needed to put it out in the sun...a word to the wise...always ask if the second-hand product you're buying comes from a smoke-free home!! Maybe you are using the wrong Febreeze. Try Febreeze Antibicrobial. My friend works for a car company and she uses this to clean the insides. I used that and it didn't take the smell out. We bought what we thought was a new mattress and got it home it smelled of cigarettes. We sprayed it with febreeze and it worked great. We are still sleeping on it 10 years later. Now you should have a very pleasant and order free Proud it. My desk has fire damage from smoke only. The original base paint is a light color, then gold painted sentences cover the top and legs to tell a story. I have been afraid to touch it. Hopefully the fresh air has helped any smell over the past 5 mths. Wow that long? Appreciate any helpful advice:) Thank you. What kind of damage? Is it just smell? Discolored? Paint bubbled? We need more info. Put crumpled newspapers in the drawers. That will absorb some of the odor. Question: Smoke Smell Removal from Furniture, Rugs, etc. How do I remove smoke ordor (from a fire) from wood furniture? Step 1 Sprinkle baking soda on the furniture and let it sit for a few hours or more before vacuuming it off with a hand held vacuum. Baking soda is a natural deodorizing tool. It's all right if some of the baking soda is left behind because it will sit in the fibers and continue to deodorize the furniture. Step 2 Steam clean the upholstery with a handheld steamer. Hold it about 4 to 6 inches from the fabric surface when steaming, and go over the upholstery a few times. The hot steam gets deep into the upholstery to kill odor and help bring it out of your fabrics. Step 3 Shampoo the upholstery with a rug shampooer that has a brush attachment, preferably a rotating brush to really work the odor out of the fibers of your upholstered furniture. Insert a mixture of carpet cleaner, Febreze or a similar odor-eliminating liquid, and hot water. Step 4 Spritz your upholstered furniture with a Febreze type of product after you have finished cleaning it. The Febreze spray helps to replace the odor with a fresh scent, at least temporarily. Good luck. Anything you can put in the washing machine, add a can of regular Coca-Cola (NOT sugar free) to the laundry along with your laundry soap. This removes the smell from clothes & other washables. For wood furniture, use ammonia, for counter tops, use Dow scrubbing bubbles (or another foaming bathroom spray) . One of the best things that cleans MANY things is a dry-cleaning sponge (see below). But the absolute best thing you can do is to rent an ozone machine. Start it running, then leave the house. Keep it 2 days & move it to different parts of the house. Our house was a huge 5 bedroom 3 bathroom two-story & in the 2 days we had the (large) Ozone machine, it removed ALL TRACES of smoke odor from our house including INSIDE the upholstered furniture & the wall to wall carpeting. I couldn't believe it! An Ozone machine removes oxygen from the room, so either leave the house or go to another part of the house with a window cracked in the room you're in. Don't run the ozone machine while you sleep! To clean your carpeting, look at this dry-cleaning method. It' does not go down INTO the carpet padding like steam does, but this stuff is simply AMAZING! & because it's not wet, it doesn't cause mold growth. * You'd need the cleaner, & the brush & a good vacuum.. You simply sprinkle on the cleaner (it's in tiny sponges) then rub it into the carpeting or upholstery with the tool, then wait & vacuum up with a good vacuum. I use a product called ScentQuest. It works great on all pet and non-pet odors. Plus it is a broad spectrum disinfectant and not a cover up. It eliminates the source of the odor. We have a 2 year old, a dog, and a cat so we use a lot of ScentQuest in our house. Just do a Google search to find out where to buy it. OK, just been down this road. Bought a really nice walnut dresser, art deco circa 1960s and was it probably around smoke since. I realized it was a smoker's home when I walked in, but didn't figured on how difficult it would be to remove the smoke smell. I came home the next day and the whole apartment wreaked of cigarette smoke. I almost gagged while trying to sleep, and I'm an occasional smoker. Bottom line, after all the cleaning, washing, rinsing, incense, freshners, deoderizers, I decided to revarnish it with a Minwax dual stain / Polyurethane. Three coats, including inside the drawers. Finally, the smoke smell is 95% gone. If I try harder and sniff real close, I can still detect it, or maybe its in my head. But at least the smoke smell is gone from the house. It that hadn't worked, I would have thrown it out. This $35 dresser ended costing an extra $25 with all the stuff I tried. So my advice; if you are not up to refinishing the item, then don't buy it. Forget trying to clean it. I have exact same issue. Probably will move this huge piece to the garage when we move and use it as a very nice workbench-storage unit! We bought a suede couch and the people before us smoked and it smells so bad. Please tell me what I can use to get that smell out. What can you use to clean wood bedroom furniture that smells like smoke? They say to use baking soda. Do you mix it with water? How do you use it to clean? Thanks. How do I remove smoke odor (from a fire) from wood furniture? Step 1 Air out the smoke-damaged furniture. If possible, move furniture outside on clear, sunny days. A carport or other covered area is ideal for airing out furniture. If moving larger items such as a sofa is impractical, open windows and circulate air with electric box fans. Smoke odors will gradually seep out of porous wood and fabric--that's why you continue to smell smoke--so keeping the air moving will speed up the process. Step 2 Sprinkle baking soda on upholstered furniture and let it sit for as long as possible, at least 24 hours. Baking soda absorbs odors and will help pull the stench out of the furniture fabric. Step 3 Vacuum the baking soda using a crevice attachment on your vacuum cleaner. Repeat the baking soda process as necessary until the odor begins to fade. Step 4 Buy and plug in an electronic air purifier. These units draw odors and contaminants out of the air and into a filter system, which will hasten the process of drawing smoke odor out of your furniture. Step 5 Spray the furniture with a smoke odor remover available in spray cans from home improvement stores. Test an inconspicuous area of fabric on the furniture before spraying the product directly on the upholstery. Step 6 Avoid using furniture wax or polish while you are getting rid of the smoke odor. Waxes will trap odors in the wood, only to release them once more when the wax begins to fade. If you have a Sam's Club near you, they have a product called Odo-Ban. It's amazing. I know several dog breeders who use it in indoor kennels, and I've used it personally to get the smoke smell out of the paneling and cabinets of my Mom's mobile home after a small kitchen fire. Archive: Smoke Smell Removal from Furniture, Rugs, etc. 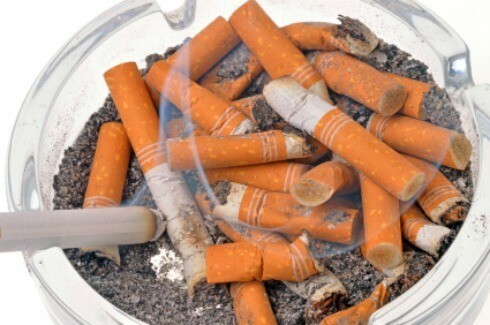 We're looking for advice on how to clean cigarette smoke smell from a coffee table. The top is marble, and the base is wood. Any tips for what is the best cleaning agent for the marble and the wood? Thank you! Smoke Smell Removal from Furniture, Rugs, etc. For smoke smell I have used the orange cleaner that has d'limonene in it, and you can use this for any smoke smell and it works great. For the wood and marble table you can use the orange cleaner then treat it after with this method. 12oz Granite and Marble Spray Polish works great on the marble. Home Depot sells it at a low price. We inherited a nice leather recliner that reeks of cigarette smoke. How do we remove the odor? I don't want it in my house until this is done. Because wood is porous and soaks up odor the only 100% way to remove odor from wood is to seal the odor into the wood using shellac or blowing the furniture up. :P This is very inexpensive and will do the job everytime. A quart will run around $8-12 depends on where you buy, but make sure you buy clear shellac and not anything tinted if you wish to keep the same color of the wood. Just apply the shellac like painting any peice of furniture. If you need smoke removed from your house or apartment you absolutely need to seal the walls and ceiling. I personally recommend BIN becuase it is shellac based and it dries within 10-15mins after application, however if the odor is not strong you might get away with Killz. A gallon of sealer can be $20-26 (BIN being more expensive, but WELL worth it!) 5 Gallons will cover around 2400 Sq Feet. Keep in mind you need to account for each wall and cieling when figuring your Sq footage. After the sealer dries apply your choice of paint and you are finished. You may still have smoke odor in your cabinets, those will need to be shellaced. You can use either Parson's cleaner or Murphy's cleaner to prep the areas first. The vents will have the smoke odor also, however depending on the what material the duct work is. If fiberglass duct work was used the smell is in here for good unless you rip it out. You can minimize the odor by getting a better air filter. By sealing the walls, ceilings, and cabinets you should be able to remove 95-100% of the smell.